Savoie is decidedly one of my favorite French wine areas with the Southwest of France, Loire Valley, Burgundy and Jura. I have always liked the wines from the northern and southern Rhone Valley, Provence, Languedoc and Roussillon, yet I have discovered that if the wines are too hot, too ripe or present too much alcohol, I’m not into them at all. As a Bordeaux native, I like Bordeaux wines a lot but I’m relatively picky with the juice from my region of origin. I need to admit that the last 18 years spent tasting between 4,000 to 6,000(+) wines a year from all around the world as a Sommelier and Wine buyer, oriented my palate towards bright, balanced, juicy, harmonious, structured and textured yet vivid red, white and rosé wines with crisp acidity, good minerality and refreshing palate rather than overripe, opulent and oaky fruit bombs. That is why, I must confess, it is somewhat difficult for me to fully appreciate New World style wines, especially when super oaky and over 14.5 degrees of alcohol. I understand and comprehend them and even realize why some people may like them, as I have to in order to diversify the wine selection on the shelves and offer a wide array of wines in the store to satisfy my customers’ tastes, but I rarely enjoy them: too heavy, too alcoholic, too woody, lacking of freshness and vibrancy. In fact, I like some of the New Zealand and South-African wines, which can be pretty good and expressive; but also some Malbec from Argentina, Tannat from Uruguay, some Cabernet Sauvignon from Chile and California, some Pinot Noir from Oregon and Washington, and even quite a few Greek and Lebanese wines. However, whatever I do or taste, it seems that I always come back to the old world, and more especially wines from vineyards located in cooler climate with higher elevation, presenting more minerals and acidity with less alcohol and crispier taste. Despite my love for Spanish and Portuguese wines in general (the traditional style preferably), fresh and crispy wines from hillsides and steep slopes seems to please my palate more than anything else, and I usually greatly appreciate the wines from Piedmont, Veneto, Alto-Adige, Tuscany and Campania in Italy, and more especially Loire, Burgundy, Alsace, Jura and Savoie in France. But why Savoie? Is it because I did my army in the “Chasseurs Alpins” in Grenoble and I’m very familiar with the area and enjoy the countless hours of trekking and climbing in the Alps? I don’t know, but one thing is sure Mountainous wines seems to be clean, pure, versatile, complex, vibrant and surely very easy to drink and enjoy. They almost feel like glacier spring water gently and slowly filtered by the rocky soils, taking all the best components the ground as to offer and restituting them in its pure and refreshing and thirst quenching mineral unique way. For me, Savoie wines reflect their environment of origin: light on their feet and lightly perfumed like a mountain breeze, pure, crisp, vivid, super refreshing, from the most simple to the most complex, they always seem very pleasing and the unavoidable minerality add an extra dimension that is extremely satisfying. Vin de Savoie is an Appellation d'Origine Contrôlée (AOC) for wines produced in the Savoie region, which is located in the foothills of the French Alps, central eastern part of France (south of Geneva). The region is divided roughly into three distinct parts: the glacially sculpted terrain along the South shore of Lake Geneva, the hilly country near the northern end of the "Lac du Bourget", and the area bordering the "Massif des Bauges" south of Chambéry. 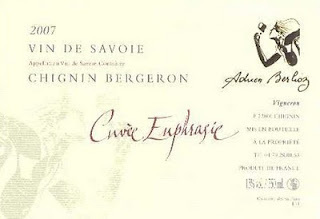 Savoie's wines: The produced wines are mostly white (more than 70%), made from grape varieties planted mainly on the slopes of the various surrounding Mountain chains (and partly in the valley) around the villages of Chignin, Apremont, Abymes, Jongieux, St Badolph and Cruet for the whites, made with Altesse (also known as Roussette), Jacquère, Chasselas, Chardonnay and also Roussanne for the rare Chignin-Bergeron. There are also some reds (relatively light yet fresh, earthy and aromatic) made from Mondeuse, Gamay Noir and occasionally Pinot Noir, and also some rosés made from Gamay and some sparkling wines. Chignin: Located about 10 miles southeast of Chambéry, the little village of Chignin resides at the foot of the high limestone escarpments in the southern part of the Bauges massif, central eastern France, in the Savoie region (eastern part of the Rhône-Alpes, bordering the neighboring Switzerland and Valle d'Aosta in Italy). Chignin (Suite): Overhanging the valley at an altitude of roughly 370 meters on the southwestern slope of the Summit of Montgelas (1300 meters above sea level), this pretty Savoyard village of Chignin can be spotted from a distance due to its 14th century tower and its 19th century chapel dedicated to Saint-Anthelme. Also, due to its location, Chignin offers a fantastic panorama of the mountains of the Chartreuse National Park, especially the "Mont Grenier", located westward on the opposite side of the valley. Moreover, directly opposite of Chignin on the other side of the valley and “niched” on the eastern slope foothills of the summit of the "Pas de la Fosse", you can also see the village of Apremont, one of the other Cru villages from "Vin de Savoie". "Les Abymes" is nestled in the valley, separating the Massif des Bauges to the east and the Massif de la Chartreuse to the west, between Chignin and Apremont. In a previous post, I was talking about the Quenard, which is a name particularly common in Savoie. Yet, Berlioz seems to take the same road, after Gilles Berlioz (read my previous post at www.ledomduvin.com/2009/08/2008-domaine-gilles-berlioz-chignin), today’s post is all about Adrien Berlioz. Adrien Berlioz took over the little family estate called “Cellier des Cray” at the beginning of 2006 and made it one of the most prestigious domaine of Chignin. The Domaine encompasses about 4.5 hectares of vineyards in organic conversion, located in a "lieu dit" called "Les Viviers" near Chignin, a small village between Albertville and Chambéry, at about 390 meters above sea level. All the vines are planted in a warm Terroir composed of rock scree on the surface and calcareous-clay sub-soil. The very steep slopes’ vineyards, with 50% of inclination for some of them, are planted with grapes such as Jacquère and Roussanne for the white and Mondeuse for the red. Adrien works with respect for the environment using, for now, the “Lutte Raisonnée” method with minimal use of chemicals, only when really necessary. He also uses Organic techniques tending towards Biodynamic, that he adapts to each parcels depending on the treatment needed to obtain the healthiest vines and grapes. Atop of not using any herbicides or inorganic fertilizers, working and plowing the ground are done with small tools to avoid tamping the soil and in the same time allow the upper ground layers and roots to breath. Everything is done mainly by hand and using a tractor will be too dangerous anyway due to the steepness of the slope in certain parcels. By working his vines and soils this way, he is hoping to be soon totally Organic or even Biodynamic. This young “vigneron” is animated by great passion and rare humility. His wines transcribe the sincerity and detailed oriented attitude of the people from Savoie, but also the richness and complexity of their Terroir of origin. Adrien gives his vines a paternal attention translated into his wines with great attention to produce the best this mountainous land can offer. This 100% Jacquère was vinified in stainless steel tanks and didn’t see any oak. The vines are about 40-45 years of age, planted on clay-calcareous soil, with a density of 8000 vines per hectares and yield averaging about 50 hectoliters per hectare. After manual harvest with transport of the grapes in plastic cases to arrive intact at the cellar, then immediate pressing with no air contact to prevent oxidation, vinification occurred in stainless still vats with regular bâtonnage of the lees for 4-6 months. It is the pure expression of this indigenous grape producing light, clear, clean white wines marked by their vivid acidity, enhancing minerality and extreme versatility. Fresh, crisp, with a slight effervescence gently titillating your taste bud, what we call “perlant” in French, without being bubbly, this wine offers blossom and white citrus on the nose and on the palate. Quite delightful and refreshing I must say. Serve it cold as an aperitif by hot spring or summer afternoon, but also with crustaceans and light fish. This 100% Roussanne was also vinified in stainless steel tanks. The vines are about 20-25 years of age, planted on clay-calcareous soil topped by scree of rocks, with a density of 8000 vines per hectares and yield averaging about 50 hectoliters per hectare. After manual harvest with transport of the grapes in plastic cases to arrive intact at the cellar, then immediate pressing with no air contact to prevent oxidation, vinification occurred in stainless still vats and oak barrels with regular bâtonnage of the lees for 4-6 months. The ageing on the lees and slight touch of oak intermingled with the character of the Roussanne grape confer this wine great complexity and texture. The Roussanne being more aromatic, layered and fruitier than Jacquère, the resulting wine is more powerful and expressive, yet it remains elegant and refined with harmonious complexity. The nose and palate are models of refinement with floral aromas, citrus and white fruits complemented by earthy notes. The gently coating palate is expanding nicely towards the inviting lingering finish. It has more ageing potential and support more elaborated dishes like white meat, fish in sauce, cheeses and desserts. Mondeuse Noire is a red wine grape that is indigenous and grown primarily in the Savoie region of France. The grape can also be found in Argentina, Australia, and California, but it is in the foothills of the Alps in the Savoie region that it is the most expressive. 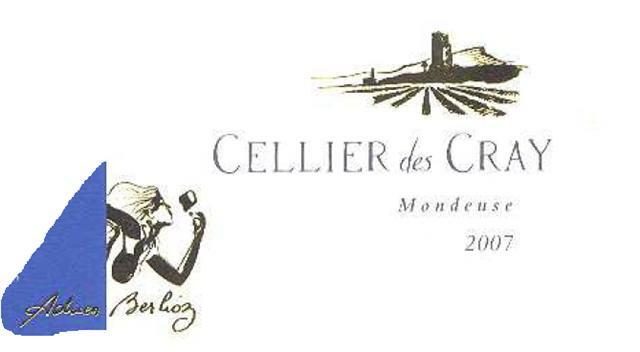 This 100% Mondeuse was crafted from vines about 50-55 years of age, planted on scree of rocks topping clay-calcareous subsoil on steep soils, with a density of 8000 vines per hectares and yield averaging about 50 hectoliters per hectare. After manual harvest with transport of the grapes in plastic cases to arrive intact at the cellar, then after a cold maceration for 12 hours, fermentation occurred in stainless still vats and the “encuvage” lasted for about 2-3 weeks. The wine was then aged for 6 to 8 months in used demi-Muid(s) of 600 liters (large oak vats) of 2nd and 3rd use (meaning that the barrels were used to make one or two more wine before the current one). Adrien Berlioz crafts “a mean” Mondeuse that is excellent. Slightly tannic, spicy, powerful yet fairly light and vivid, voluptuous and “charpentée” (meaning structured), this Mondeuse is the unaltered expression of the Terroir intermingled with red cherry fruits, floral and earthy notes. What a lovely wine! Here again, like the Roussanne, it has good ageing potential and food friendly attitude. Pair it with game, venison, hare and Savoie’s cheeses like Tomme de Savoie and Reblochon. 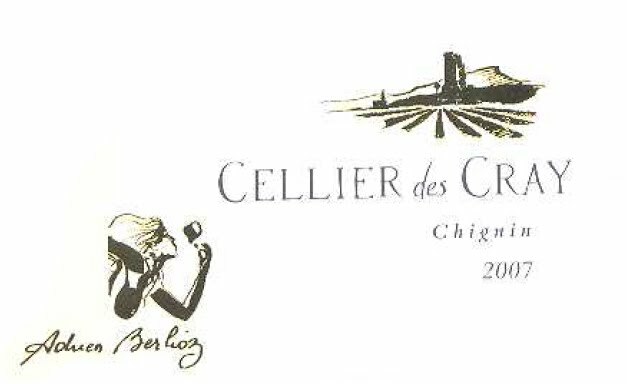 In conclusion, I will say that the passionate Adrien Berlioz, a young "Vigneron-Récoltant Indépendant", crafts some really interesting wines that reflect his personality and the character of their Terroir of origin. They deserve all your attention as they just arrived in the US market and are very promising. Info partly taken and edited from an email from Adrien Berlioz and different other sources to produce a winery technical data sheet for Savio Soares Selection. If you like this producer try also Domaine Dupasquier from Jongieux. Their Altesse and Jacquere have the same 'fresh' atributes as described above. I couldn't agree more about the qualities of Mondeuse - it's worth hunting out! Thanks for the tip, I will try to taste it soon if I can. In the mean time I just tried the Roussette from Eugene Carrel which is really good for about $14.99. Interesting! I could write down something similar if I was aware about that terms, specially the part about the New Zealand and South-African wines. There are to many brands, and it would be nice if you can add a new recommendation.